Increased Nitric Oxide (NO) levels have also been shown to increase cells sensitivity to insulin, making them helpful for people with diabetes. There is also evidence that higher levels of NO can reduce joint pain, improve bone density, and aid memory and brain function. 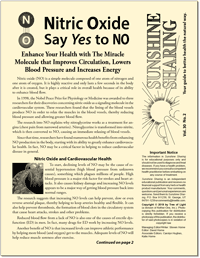 Learn about all the amazing benefits of NO and how to find out if your NO levels are low in this issue of Sunshine Sharing. In addition learn you how you can enhance your NO levels naturally with diet and supplements. Iridology is the art and science of examining the colored part of the eye (the iris) to acquire information about a person’s physical, mental and emotional health. This course is an introduction to the practice of iridology and qualifies as an IIPA level one course. 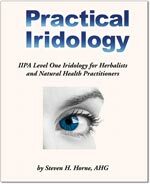 In the past, the Practical Iridology manual has only been available as part of our Practical Iridology (IIPA Level One) class. You can know purchase it separately for self study of this amazing health assessment tool.